Web of Science: Will the sea and wind eventually erode Iceland down to nothing? Will the sea and wind eventually erode Iceland down to nothing? 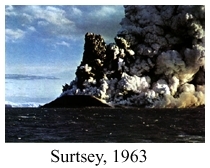 Unlike the island Surtsey which formed in the sea S of Iceland 40 years ago and probably will disappear within a century or two, Iceland is constantly being renewed through the formation of new crust which balances the erosion by wind and waves. Until about 62 million years ago, Great Britain and Greenland were parts of a single continent which then started breaking up and the North-Atlantic ocean began to form. At that time the Iceland hot spot, having been kept under the lid of the continental crust, poured profusive basalt successions on top of the continental margins on both sides of the ocean. These basalts are now seen in Scotland, Ireland, the Faroe islands and East Greenland. As the ocean widened, volcanic activity continued at the hot spot and a land bridge must have existed between Greenland and Europe at least until the ocean had reached 300-400 km width. Eventually, the distal parts of the land bridge sank into the sea and Iceland became an island. The North-Atlantic continues widening and volcanic activity continues in Iceland. Thus ocean floor spreading causes 2 cm to be added to Iceland each year through the formation of new crust along the rift zones that cross the country from SW to NE. This growth is, however, counterbalanced by erosion at the coasts and by the thermal shrinking of the crust which causes the land to sink below sea level as is moves away from the hot spot. Thus it may be surmised that Iceland has maintained approximately its size through time - that the constructive and destructive forces have been in balance and will remain so as long as the mantle plume beneath Iceland stays active. Sigurður Steinþórsson. „Will the sea and wind eventually erode Iceland down to nothing?“. The Icelandic Web of Science 5.3.2005. http://why.is/svar.php?id=4805. (Skoðað 21.4.2019).